This article surveys progress in both fundamental and applied research related to cellulosic liquid crystals, mainly of chiral nematic order. These liquid crystals are divided into two different classes, namely cellulosic macromolecules and cellulose nanocrystals (CNCs), depending on the mesogenic constituent. 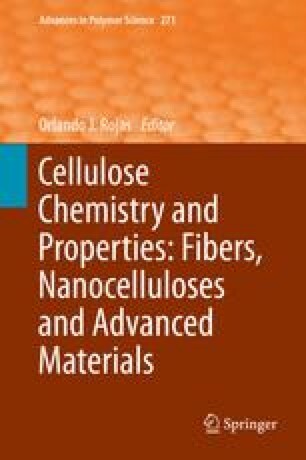 We start with a review of the fundamental and chiroptical characteristics of molecular liquid crystals of representative cellulose derivatives and then discuss recent efforts on the design and construction of functional material systems (such as stimuli-sensitive optical media and novel hybrids with minerals). These systems make use of the liquid crystalline molecular assembly of cellulosics. The survey of the other class of cellulosic liquid crystals deals with colloidal suspensions of CNCs obtained by acid hydrolysis of native cellulose fibers. Following the review of fundamental aspects related to the isotropic–anisotropic phase separation behavior of CNC suspensions, attention is directed to current applications of free-standing colored films, polymer composites reinforced with CNCs as mesofiller, and inorganic hybridizations using CNC chiral nematics as template. Some comments and the outlook for future explorations are also offered. One of the authors (YN) is grateful to Professor O. J. Rojas of Aalto University for his encouragement and helpful suggestions as well as for his kind invitation to contribute to this special volume. The authors also wish to convey many thanks to Professor Y. Teramoto of Gifu University, and to the graduate students K. Horikiri, T. Ogiwara, and T. Hirata in our laboratory for their assistance in the preparation of this chapter.